Atlanta is rich in African American History including being the birthplace of Dr. Martian Luther King, Ralph David Abernathy, Sr., home to John Lewis and many famous Civil Rights Leaders, additionally you will find two of the most prominent Historical Black Colleges in Atlanta, Morehouse and Spellman. Join us as we explore other hidden historical jewels of Atlanta; Tour highlights Atlanta’s historic West End, The West End neighborhood of Atlanta is on the National Register of Historic Places. Tour highpoints are the Hammonds House Museum, The Wen’s Nets and its contribution to the heritage of African American folklore and The Herndon Home and Museum. For lunch we feast on “Soul Food, “the traditional cuisine developed by the African slaves mainly from the American South. Private tours are available rules do apply. Begin your tour with tree centralized pick-up locations in Atlanta located in Midtown, Downtown and Buckhead. Tour begins at 10:30 am. 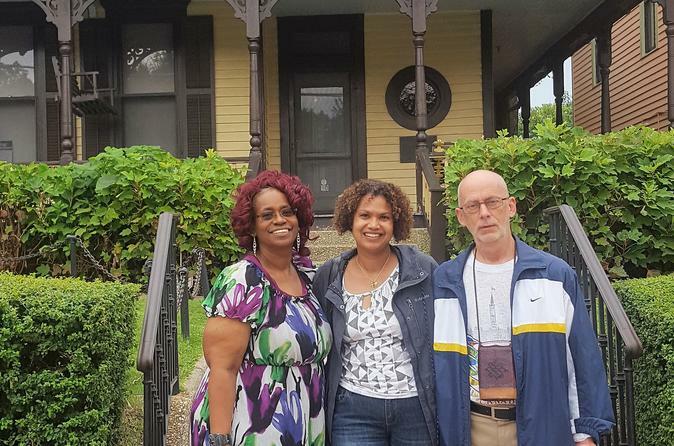 Nestled on a quiet residential street in Atlanta’s historic West End, Hammonds House Museum is a unique setting to explore the cultural diversity and legacy of artists of African descent. The Museum boasts a permanent collection of more than 350 works dating from the mid-19th century by artists from America, Africa, and the Caribbean, including 18 works by master artist Romare Bearden. Next we visit The Wren’s Nest was the home of Joel Chandler Harris from 1881 until 1908. Harris created the Uncle Remus character. His home is one of only a few remaining Queen Anne Victorian homes in Atlanta. It’s a unique example of upper middle class living around the turn of the 20th century. A lunch break is taken, and we conclude our tour Herndon Home and Museum. We learn about Alonzo Herndon’s rise from slavery to leadership in the Black business community, A sterling example of upper income dwellings in the early 1900’s, the Home’s interior draws upon various design traditions, including the renaissance revival forms of the reception hall and dining room, and the Rococo detailing of the music room. Designated a National Historic Landmark in 2000. Lunch is included on this tour, we stop at Q time. A modest location but take it from a local this place might quite frankly be the best soul food in Atlanta. A private tour includes a storyteller for your group at the Wren’s Nest: Storytelling is ideal for people between the ages 4 to 104.